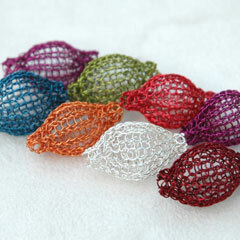 I first saw YooLA’s work on Ravelry.com when she uploaded her crocheted metal pears. I’ve tried crocheting with wire before but never been very successful at it, so these large items caught my attention. Of course, you don’t want to jump right into such a large project so YouLA’s Pixie Beads are just right for a beginner. The tutorial provides detailed but understandable instructions along with plenty of photographs illustrating each step. You can use colored wire or silver or gold wire depending on the look you’re going for. String several beads together for a necklace or use just one for a stunning accent. When you’re ready to move on to bigger things, YouLA has several tutorials available for $10.00 each in her Etsy shop, including pomegranates, pears, bracelets, and earrings.